The sky is beginning to drop its heavy white. Clumps of fog tumble down from the mountaintops into the valley where the cottage is. I stand by the window with my dad. I’m not sure it’s a good idea to get up too high, he says – today we’d hoped for a climb. He’s here for my last two nights in North Wales. He hasn’t been back to this spot in over twenty years. At breakfast we talked about how he first came with friends from university to tackle the mountains. I hope you’re not disappointed, my dad says, knowing I’d wanted to climb Snowden. 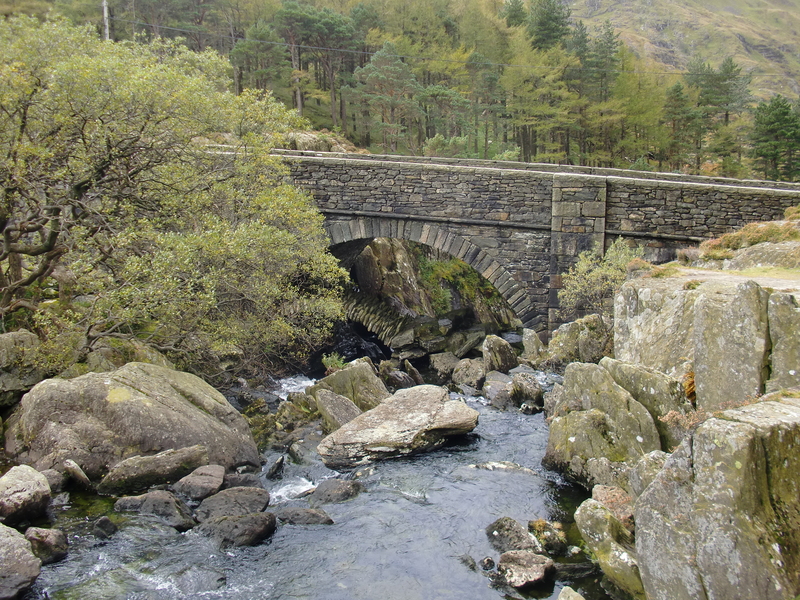 Of course not, I tell him, suggesting a low route along Llyn Ogwen instead. This is a walk I’ve wanted to do, but not on my own because I thought the rocks along the water’s edge would be slippery. I’ve cycled past the lake several times during my stay, mesmerised by its shape. It stretches out at the top of the valley, reaching as far as it can up the surrounding mountains. The water is impenetrable, often looking like molten lead. 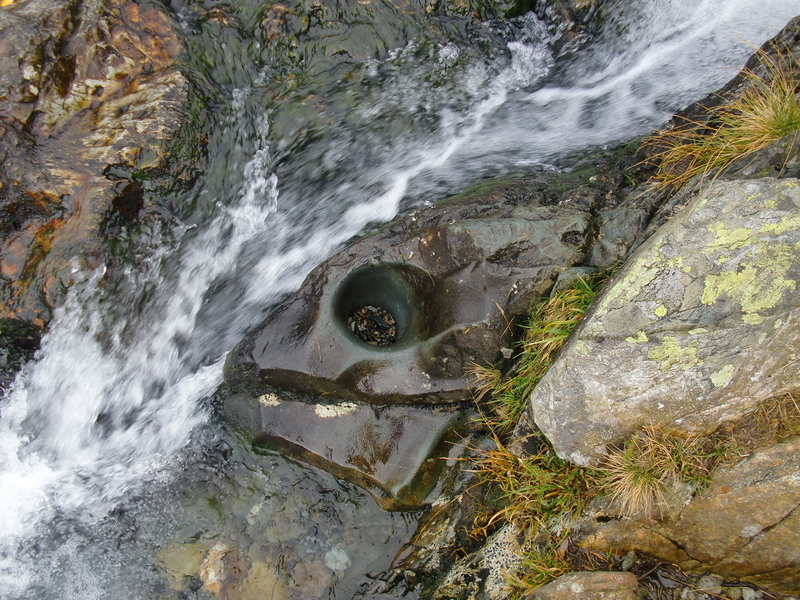 I suspect this has to do with the fact that the sun has shined very little over the last few weeks – but another part of me thinks of the myth of King Arthur, knowing that this is one of the places rumoured to be the final resting place of Excalibur. The lake remains dark, holding its secret. A wooden fingerpost marks where we need to leave the road and locate the path alongside the lake. The initial way is hard to trace through the scattering of rocks. There are abrupt steps up, mixed with narrow, flatter passages. We’re scrambling, which is what I like the most – that act of balance, where the eye has to be really keen, always looking one step ahead. I had a wonderful scramble years ago when I was living in Mexico, renting an apartment at the top of a dilapidated hotel in Mazatlan. The rooms were set around a crumbling courtyard. Next door to me was a Shaman from New Mexico who taught pottery. A young friend of his had come to visit with his mother and the three of us set off one day, as the pottery lessons were beginning. We walked miles down the coast. The road was high above sea level. A steep cliff dropped down to the water on our right. In the afternoon, we spotted a small beach below, and followed a staircase cut into the rocks. Down on the sand, huge boulders rose out of the water, lining the coast at the bottom of the cliff, until the headland, which hid the hotel from view. We picked out another set of steps, leading to a school at the top. Here we could rejoin the road for the last few hundred yards home. We set off. I only had a pair of flipflops, but it was manageable. The three of us went steadily. It was a long way over those stones, but we found a rhythm and went in single file. We only spoke to talk of the experience: if we’d landed a particularly slick combination of rocks, or lost balance for a moment. Sometimes, we had to stop, if the way looked tricky and needed a minute or two of planning, but then we’d set off again. We were a chain, linked by the day, by what we felt, navigating the dark spaces between each boulder. Often, the only sounds were of our feet, slapping down. When we reached the school at the top of the steps, there was no way through. The door we’d seen in the wall was locked. It was all quiet. We followed the wall, looking for a low point where we might be able to climb over. We agreed that if there was a staircase there had to be a way through. Eventually, we found a narrow alley between two buildings, wide enough for a person. At the end, was a steep slope of smooth rock, which rose a couple of meters, and then a wooden fence that was another two meters. It was scale this or scramble back over the boulders to the beach, climb up to the road, and then walk the long miles home. Going back seemed to threaten undoing all the joy from the day. The son went first, scrambling up the slope of rock and coming to stand on the small ledge, before gripping onto the top of the fence and springing up to get his leg over. He stayed lodged on the fence post to help his mum next. I pushed her up the slope from below, wedging my shoulder into her arse, the two of us groaning. Come on! yelled her son. I am, bloody hell! she shouted. Finally, he grabbed her wrist and pulled her over the fence. Despite the heat of the day, it was only now that I became aware that I was sweating. I stepped, pressing my fingertips into a sharp edge of rock. Then, I brought my foot up, rubbing it over the stone to find another place where I could get a hold. Trying to take as much weight as I could with my fingers, I pulled, feeling a strain in my knuckles. I got my foot onto another lip. My flipflop pulled sharply between my toes so that I winced. I reached up and put my fingers through a hole in the wooden fence and tugged – my shoulder socket popped – but I finally got onto the ledge. The son took hold of my wrist, helping me onto the top of the fence, and then we both jumped down. I had met them only a few days earlier, but the three of us hugged – the mum in tears. We cheered and said how much we loved each other, and couldn’t be separated for the rest of the day. What I love about such tests, is the pleasure of arriving home. This was how I felt in Mexico – that satisfaction turned euphoria. It’s consolation for the experience having ended: something new and powerful rushes in, redirecting your feelings, so that they aren’t snagged on the sadness of an ending, clinging forever, unwilling to release. As my time in Wales drew on, I often wondered how I would let go. I imagined that, when the moment came – once my dad and I had packed the car – I wouldn’t be able to leave. Some things are hard to give up. When King Arthur lay dying after the Battle of Camlann, he asked Sir Bedivere to throw Excalibur back into the sea. The knight took the sword but, tempted by its beauty, concealed it under a tree. When he returned, Arthur asked what he’d observed. Bedivere said: nothing but the waters deep and the waves wan. Though art untrue, Arthur told him. He went back a second time, but only threw the scabbard into the sea, still unable to let the sword free. My Dad and I stop for a moment, breathless. We are on the return journey, beginning to wilt. Across the lake we see the bright dots of helmets, making their way up the dark, vertical rock. That’s a good spot to learn, Dad says. He smiles and I can see all his memories, rising up inside him, glowing like the sun. We carry on, a final push, our legs weary. And then we both stumble in quick succession. I’m surprised at how little it hurts, even though I slap my back on solid rock. It happens so fast I don’t realise, until it’s clear I’m unexpectedly looking at the world from a different angle. What am I doing down here? I think. Are you all right? Dad calls back. I nod and we keep on, hitting the road, and then going through the valley to the cottage. Slumped in chairs with the kettle boiling, it’s clear how happy Dad is. The look on his face is as if he still can’t believe it. So many years have gone by. He was young the last time he came, but perhaps he still feels young. It’s only been several years since I was in Mexico, but I think about that time and the person I was, and I’m struck by the distance between then and now. It was the longest I’d been away – a year and a half – and it was hard to come home. I felt sickened by shops, having spent so long only buying what was necessary. I had a limited budget, using what I made from baking and selling chocolate brownies on the beach. Back in England, fashion made me sad. Even now, as we move into Winter and I see manikins done up in fancy coats, I find it strange we’re induced to buy new clothes, just because this season’s styles are different. Travelling takes us back to our most basic parts – flesh and bone. We can spend so much of our lives ‘covering up’, that these unknown places seem frightening; like strangers. But, when you get reacquainted, happiness comes at a deep level, and it’s not easy to give up – just as it was hard for Bedivere to relinquish Excalibur. I don’t think it was simply because of its splendour: there was everything it represented, everything that had gone before, which he couldn’t let go of. Both in Mexico and Wales I grew accustomed to the beauty around me: the quiet, peach-tinted Pacific sunsets; the Welsh mountains, rising out of the ground, unconquerable. But there was also the way of life: so calm and deeply animal, which had created a space for learning. I sit down, for the first time since coming back to Oxford, on the cushions in my spare room, where I often write. Picking them up to rearrange them, I am swamped with the feeling of the cottage in Wales where the cushions had been for nearly three weeks. I see myself coming back from a long cycle, talking out loud at how glad I am to have finished, sinking into the rocking chair to summon the last dregs of energy so I can light the fire. The cushions still have a dusty, damp, smoky smell to them. They have come home changed. Bedivere went back to the lake a third time, and only then was he able to hurl Excalibur into the air. The sun hit the metal so that the sword appeared like a streak of lightening for an instant. A fair, glowing hand, and arm clothed in white, rose from the waters and caught it. Finally, the magic was allowed to happen. My dad can remember his youth on those mountains in Wales and feel, wordlessly, the great space in between, which is more than time: it’s the way we change as individuals. This change feels like the work of some magic too – this great learning and transformation. Standing in my spare room, amongst my cushions, I am amazed how I can be in one moment, remembering powerfully some other that came before, so that in an instant I’m two people at once. 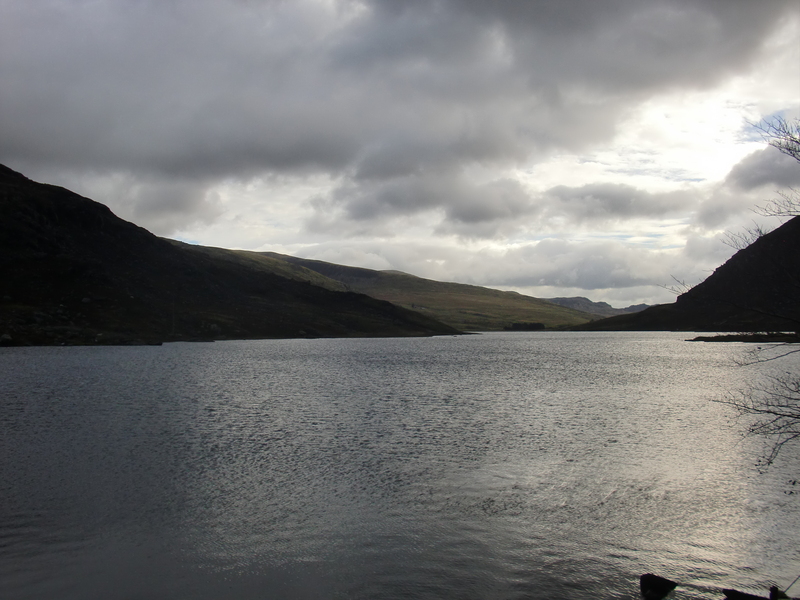 I think of Bedivere, standing on the shore of Llyn Ogwen, holding the sword in his hands: this great act of returning. It feels that whatever it was I took to Wales, inside me, I didn’t bring back. But I have not come home empty handed. I have taken enough trips to know that we go with one feeling and return with another – like some wonderful chemical process. When all is done, experiences remain. And they can rush to the surface at moments when we least expect, fluttering beneath the flesh, delivering time and again. 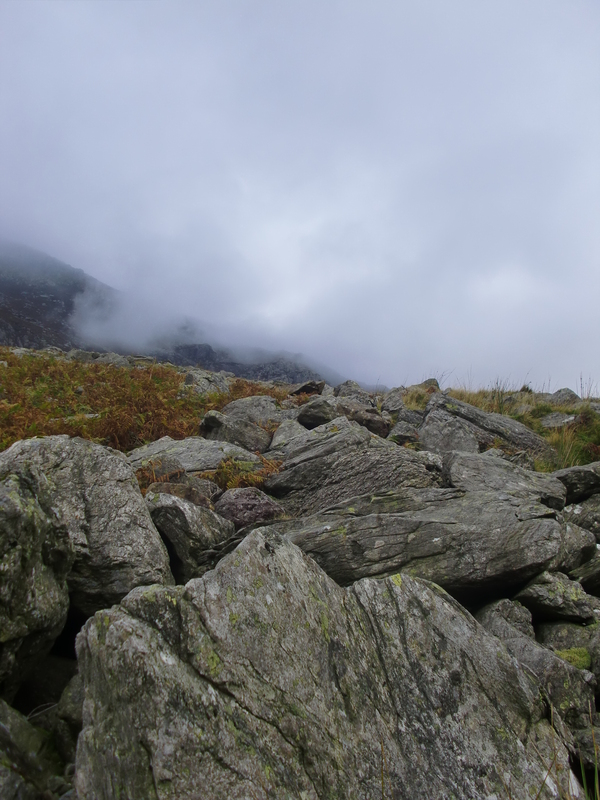 This entry was posted in History, Memoir and tagged Adventure, Battle of Camlann, Bedivere, climbing, Excalibur, Gabriela Blandy, happiness, Hiking, how to write, King Arthur, Llyn Ogwen, Memoir, Mexico, North Wales, travelling, Writing, writing advice. Bookmark the permalink. What a beautiful essay about how the world changes us. I love the damp, smoky smell you describe. When my husband’s family sends us Christmas presents, we all take huge whiffs of the smells that arrive with them–the smoke and damp and earthiness that is so distinctive. My kids look at me in wonder when I tell them they are half-English. England is a place of wondrous candy bars and Excalibur and conkers and smoky pubs. Love, love, love the King Arthur references. I’ve just come from your blog! I have to say, I was thinking of you when I wrote the King Arthur bits because of what you said a few weeks ago on my post. I’m so glad you read this and enjoyed it. And yes, that gorgeous moment when you smell a parcel that has come from another place. So nice to think of that. And I so appreciate all the positivity about England. I guess it can be pretty cool sometimes. I love how you can turn anything into a wonderful colourful story full of adventure! Do you write poetry at all? Thank you – that’s wonderful of you to think. Poetry? I’ve not done much of that – though there is a rare attempt on my second post about swimming and lakes. Why do you ask? I just imagine you would be very good at it! I had no idea you were Welsh!! I love that image of the blanket – thank you. Yes, I enjoyed being that woman in the Wilds. I’m already trying to think where I can get to next! Thanks for taking the time to read and comment – I’m really pleased that you enjoyed it. Hilary! I always love it when people make references to the fact that they didn’t really have the time to read, but then got sucked in. For you to say that I am managing to strip away the unecessary stuff is truly a compliment! And to be honest, you are always there in my mind saying, ‘distil’ when I write ;-). Well observed on the whole meditation thing: I certainly found a lovely rhythm with my practice in Wales, which has helped the writing hugely. Such a pleasure to see you here! Forgive my cop out for not replying in length. I just want to say Gabriela that again you transported me to a place filled which heightened my senses, smells and described a place of magic. You have such a knack of taking the reader with you – and I thank you. Cop out?!?! This was a great reply – just for me to know that I succeeded in an act of transportation and brought everything alive for you. Thank you for being such an appreciative reader. Ju, I love the idea that I am respectful of nature. I am always in awe of it. Yes, this idea of pushing beneath the surface is important – and lovely that you take the time to bring that home to others, especially children who can teach us so much about the world through the way they see it. Sad, yes – I have been ‘back’ in Wales daily. As always, thanks for your astute comment. Thank you! I love wows! And, this is my life… I’ve just spent the last few weeks on my own in North Wales, cycling and hiking, and trying not to go too loopy. I’m really happy you liked it – it’s really such a boost when new visitors are complimentary. I enjoy the weaving part of writing – it’s probably my favourite part. Really enjoyed this piece. Being a welshboy myself it brought back memories of visiting Snowdon (or Eryri in welsh!) with my dad and brother. I’ve never thought of myself as someone with a strong sense of national identity but I guess I do have a deep affinity for the land and my heritage. My grandfather used to take me and my brother around various castles in Wales and thinking back on it now I’m awfully glad he did. The descriptions in your piece were beautiful and your discussion of travelling really insightful! Glad you enjoyed your trip to Cymru! It’s a strange turn of events because I think I was visiting Oxford around the same time! I’m a bit in love with the town actually! Oh, the castles! They were one of the things that made me wish I had a car so I could get around more and see them. Next time. Interesting that you were thinking about Oxford. It is such a beautiful city – not at all a bad place to come home too. Now that autumn is here, the buildings look even more stunning – covered in bright red creeper. Thanks for dropping by! Quite an adventure! In flip flops, no less!